Are you watching what you eat or limiting carbs? I’ve been eating healthier since the beginning of the year and that means I’ve cut back a great deal on carbs. Though I enjoy making and eating rice, it’s something that I don’t have to often anymore. Good thing there are other flavourful alternatives like cauliflower rice! It’s healthy, low carb and delicious. And I can enjoy it guilt-free! I don’t feel bad about having seconds. This recipe for Cauliflower Rice Enchilada Bowl has all the spicy Mexican flavours I love minus the carbs. Even if you don’t care that much for cauliflower on its own, you might like it in this recipe. I’ve made cauliflower pizza crust and mashed cauliflower in the past. Though you can tell that it’s different, it still tastes good to me especially when I know that I can eat it without worrying about my waist line! At first glance, you can’t even tell that it’s not actually rice in the bowl. If you look close enough you can see, but you’ll have to get past all the bright toppings taking centre stage! 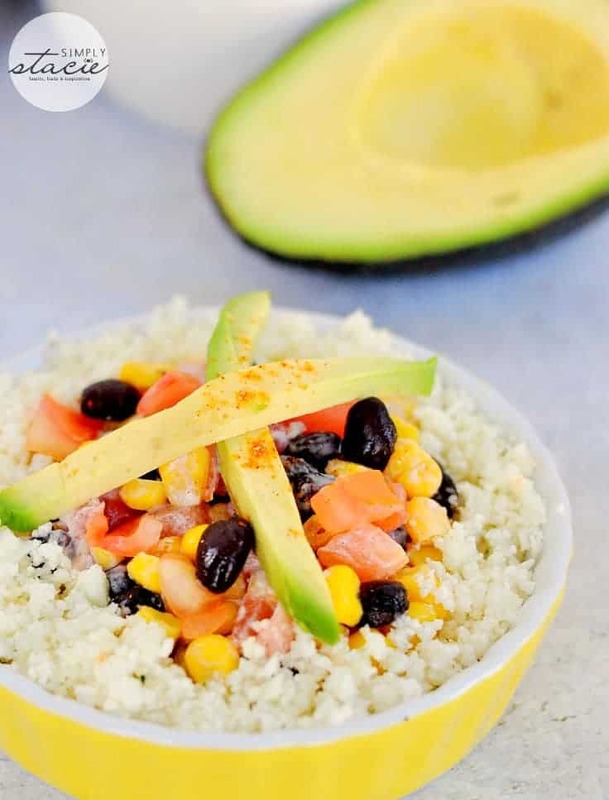 Whether you are watching your weight or not, this Cauliflower Rice Enchilada Bowl is a healthy way to get the daily recommended amount of veggies in without sacrificing taste! A healthy low carb meal you can enjoy guilt-free! Cut cauliflower into large pieces. Pulse in food processor until it resembles pieces of rice. Transfer to steamer basket and steam for 5 minutes. Meanwhile, combine sour cream and taco seasoning in a small bowl. Set aside. Reserve 1⁄4 cup each of black beans, corn and tomato. Combine the remaining black beans, corn and tomatoes in a medium bowl. Stir in sour cream mixture. This looks great! 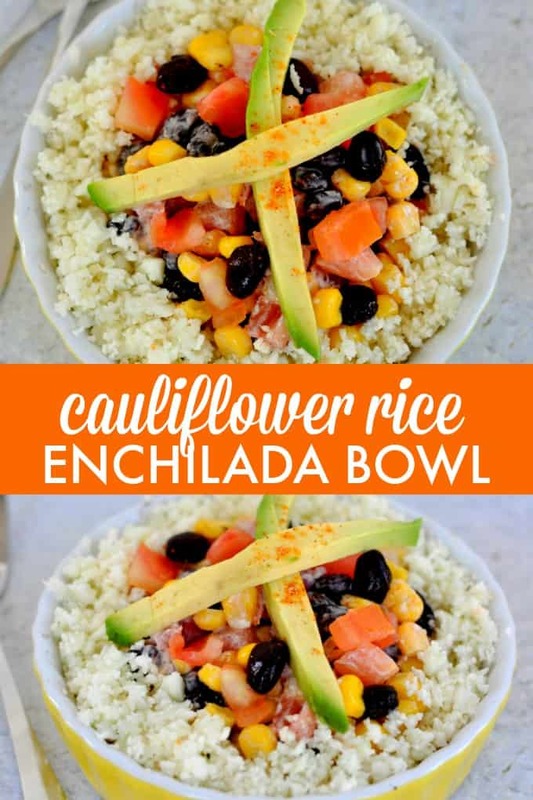 Cauliflower rice is my new favorite….this enchilada bowl….I. Must. Try. This is one recipe I have got to try! I’ve tried using cauliflower to make the pizza crust and it turned out great! This looks and sounds really good! Thanks for the recipe. I have everything for this amazing recipe to make today! I like to eat meatless meals once in awhile, and this is going to be a great recipe to try! 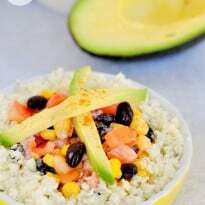 Have not tried cauliflower rice but love cauliflower and will try to make this! I’ve heard of cauliflower rice but haven’t tried it yet. I love cauliflower so I should like it! This recipe is so simple and looks delicious. I love Cauliflower and this dish looks so delicious. I definitely want to try this recipe. I am always trying to find a way to use cauliflower. This looks good. Your recipes always look so sublime.This looks refreshing delicious and healthy too.Thank you. I’m not the cook in the family but I’ll be requesting this one! Thank you for this recipe. I love cauliflower recipes because it does cut down on the carbs and still tastes great! Cauliflower rice is easy to make and a great substitute for starchier rice. Pinning this to my cauliflower low carb Pinterest board. This sounds delicious! I’ve been trying to limit my carbs and sugars. And this recipe sounds like just the dinner I need! Thanks! What a great healthy idea! Thanks ! Saving this one! So unique, colourful and creative! I would love to try this! Looks amazing! Mmmm..I’m in love with cauliflower, and I’m so excited to try out this enchilada bowl!! It looks absolutely delicious! 🙂 Pinned! I made this for lunch it was very good. Perfect for the healthy eating kick I’ve been on! Thanks for sharing! 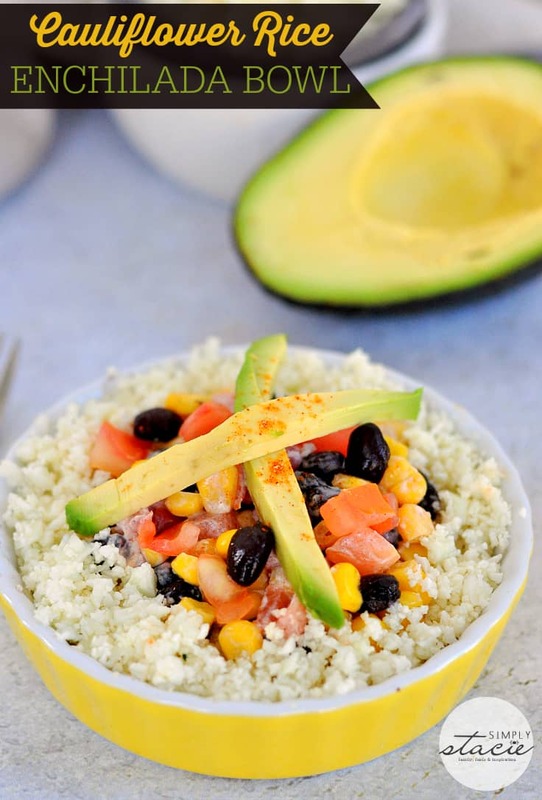 Your Cauliflower Rice Enchilada Bowl looks wonderful! Thanks so much for sharing with Full Plate Thursday and have a great week. this looks great. i would add some cilantro. 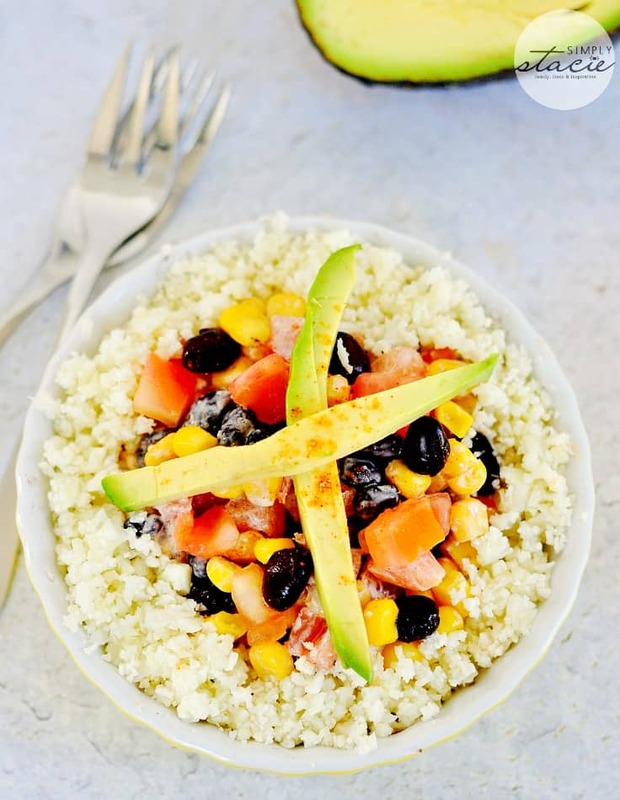 We love burrito bowls, but I’ve never tried them with cauliflower rice before! Looks yummy! this dish looks delicious, can’t wait to try it, thx! This sounds like a very great recipe for a delicious meal. Thanks for sharing today. I’m loving this recipe and I can’t wait to try it. I love tacos so this mixture sounds delicious and best of all, really healthy.